It was a comfortable win for the Marina Machans over a toothless Gaurs outfit. Chennaiyin FC squared up against the likes of FC Goa in this important second leg clash at the Jawaharlal Nehru Stadium, Chennai. Chennaiyin FC came out all guns blazing and coasted over Sergio Lobera's boys. Jeje's brace and Dhanapal's header meant that the Marina Machans will now face Bengaluru FC at the Sree Kanteerava on the 17th of March in the fourth edition of the Indian Super League. Here's rating every Indian who played a part in this match. The ever so dependable Karanjit Singh was on top of his game today. He pulled off a couple of very crucial saves at the beginning of the match which helped the team massively. He looked a lot more confident in defending the corners as he finished the game with nine punches with a bulk of them coming from corners. He faced five shots on goal and he saved all of them. A solid, top-drawer performance from the Chennaiyin keeper. This was Chennaiyin’s best defensive performance this season and Jerry was actively part of this back four throughout the tournament. Jerry’s task today was to contain the menacing Lanzarote and he did that to perfection. The young defender totalled four tackles, three clearances, two interceptions and two blocks. It was another one of those solid performances for the kid and he has undoubtedly been the most consistent performer in the team for Chennaiyin this season. An absolute powerhouse for the Southerners. It didn’t look like he stopped running for even a second until he was taken off for Anirudh Thapa in the 71st minute. He created a very good chance for the team and also had a shot which missed the target by a very small margin. He had two5 passes with 64% of them hitting the mark. He capped off his great performance with three tackles, three clearances and one interception. A strong performance from the local boy Dhanapal. He got into the books early but put in a much-disciplined performance until the end of the match. A well-worked set-piece meant that Dhanapal was going to get his second goal of the season. He had a total of two shots with one hitting the target which resulted in the goal and other was way off. He had a total of 19 passes with 44% of those going to the intended target. He totalled one tackle, three clearances and one block to end the night. Another hard working player for the Marina Machans. Fernandes was all over the pitch for Chennaiyin and his work rate was impeccable on Tuesday night. The 32-year-old's movement off the ball, his constant pressing caused all sorts of problems for FC Goa. He made 32 passes at a 75% completion rate. To add to that, Fernandes had one tackle, one clearance, one block and one cross. It was easily his best night in a Chennaiyin shirt. Even the best of strikers in the world go on rough patches in their careers and the quality of a striker is determined on how he reacts when he is one and how he gets out of it. Jeje’s impact in the team had been questioned multiple times before this match and during his goal drought and he came out of this game with two goals and there in breaking the goal drought in absolute style. He had five shots all game with two hitting the back of the net. He also had 28 passes to show for with 71% of those hitting the mark. He was ruthless in his pressing play today and his touches did not seem to let him down at all. Thapa was on the pitch for a little less than 30 minutes. Having come on for Bikramjit, Thapa was expected to replicate what Bikram had been doing for the first 70 minutes. The 20-year-old completed his task to perfection and even managed to trouble the Goan backline with a shot which missed the target by not much. He made 11 passes with one block and one tackle to show for. 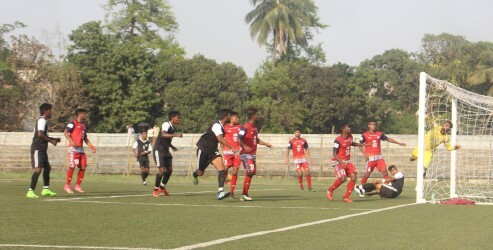 Faced with deadly counter-attacks and a snoozy defence, Naveen Kumar was struggling to find his footing in the match. The two shot Chennaiyin took had resulted in a goal and it completely damped his confidence. He faced seven shots on goal and saved just four of them. He had three catches and three punches to show for but his defenders let him down big time. The best defender for the Goan based outfit tonight, Seriton Fernandes was desperate in trying to stop the Chennaiyin attacker’s to serve a beautiful ball to Jeje. Although he did get beaten a couple of times, he suppressed most of the attacks that were brewing on his side. He had an exceptional nine tackles in the game, also added one clearance and three interceptions. He finished the game with 53 passes with an 85% completion rate. His mistake in clearing the ball during a set piece resulted in the second goal for Chennaiyin FC in the space of three minutes. Sana Singh had no tackles to show for throughout the game, which is a testament to his ineffectiveness in Tuesday's semifinal. He had two clearances, one interception and two blocks to his name. Chinglensana failed to show up on a big occasion such as this and it proved to be costly for Goa. 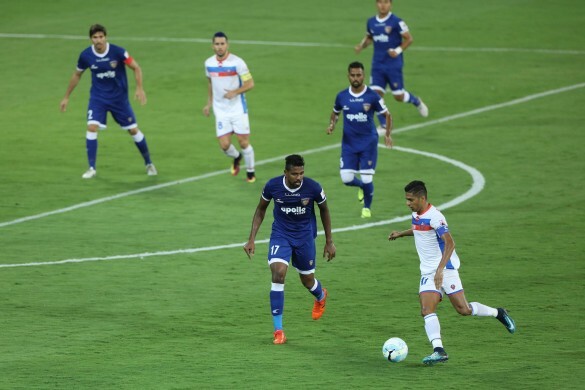 Taken off in the 59th minute for the Indian midfielder Brandon Fernandes, Narayan Das had a very mediocre showing in the second leg of the semi-finals. He struggled against the Chennaiyin winger, Francis Fernandes. Das completed 42 passes with an accuracy of 76%. He totalled two crosses, three clearances, two interceptions and one tackle. Halder’s impact in the game was highly minimised by the blue’s midfield. He had 56 passes at an impressive completion rate of 86% but thanks to Chennaiyin’s high pressure, a bulk of those were back and side passes. He had just one tackle and one block to show for which capped a sub-par performance. The best Indian on the pitch today for FC Goa, Mandar created a lot of problems to the ever so resilient Chennaiyin defence. His five crosses caused a lot of problems for Mailson and Sereno. He also had two shots on goal which were on target but Karanjit was determined to stand as a brick wall in front of the goal. Mandar finished with 30 passes with 57% of them hitting the mark. Brought on as a creative option, Brandon Fernandes did nothing of much relevance to the Goan attack that desperately needed a goal. His contribution to the attacking phase was little to nothing for Goa as he did not create a single chance. He had just one cross to show for and made just sixteen passes at an accuracy of 62%. Pronay Halder made way for Ali in the 67-minute mark. Ali, like the other Goan subs, did not make a worthwhile impact in the game. In his 27 minute appearance, Ali registered eight passes, two tackles, one interception and one block to cap a very dull performance.